How to Browse Internal PDF Structure in adobe 9.0? I didn't find the advanced menu that has this option. There are several ways to browse a PDF's internal structure. Warning: Whitespace is largely irrelevant and usually removed when possible. I just made this pretty to make understanding it a bit easier. << and >> begin and end "dictionaries". Dictionaries are made up of key/value pairs. The key is always a "name": all names start with '/'. The value can be anything, including another name. [ and ] begin and end "arrays". Arrays can be made up of just about anything. Numbers are "numbers". Floating point or otherwise. () and <> begin and end "strings". <> strings are listed as hex values, () are ANSI strings. Pet Peeve: /Names and (Strings) use entirely different escape systems. Grr. In the above example object, the content stream is in object 4, elsewhere in the PDF. To find it, you can use your editors text search for "N 0 obj" where N is the object number you want. WARNING: There are hundreds, possibly thousands of objects in a PDF. Searching for "1 0 obj" will get you a LOT of hits. Given that you're asking to see the internal structure, you probably already know all this. Others wanting to know the same thing may not. WARNING: Do not EDIT a PDF in a text editor. All that binary stuff will get mangled, byte offsets are Very Important in PDF. There's an acrobat plugin called PDF CanOpener by Windjack Solutions (no affiliation). It's SLICK. You'll be able to browse the PDF structure as a tree, look at (and modify) content streams, and so forth. Lots. Many folks build one as part of learning to parse PDF, or as a debugging tool. They're Quite Handy. O2Solutions offer an MS Windows compatible utility for viewing the internal structure of PDF documents. It's free for personal and commercial use. You can also use commercial PDF CanOpener plugin for Acrobat to see the Object structure or free PDFedit to decode compressed data streams in PDF. PDF Vole seems to be broken. If anyone is still looking for a tool, I'm using the free PDF Analyzer. 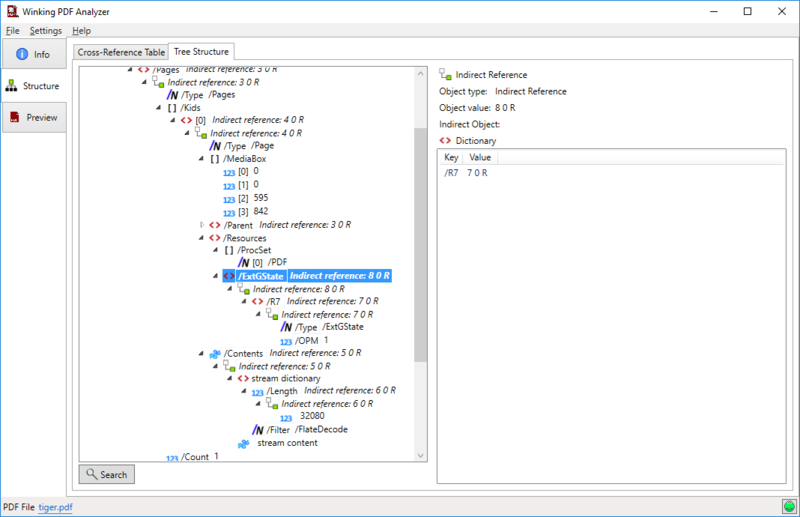 The free PDF-XChange Editor has a Content panel which lets you view the tree structure of the PDF file. Inspecting and filtering vectors in PDF from command line? How can I set my own bookmarks in a PDF? How can I unsecure a PDF that has no password? How to save a PDF form as a printable PDF in Adobe Acrobat Reader DC?